Posted on November 13, 2018 at 4:04 pm. SPOKANE — When it comes to leasing farmland, experienced farmers say it’s important that the ground meet as many of their needs as possible. 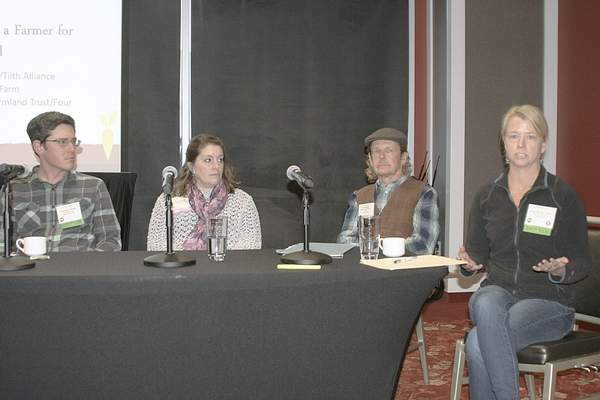 Several farmers spoke during a panel about helping farmers and landowners connect at the Tilth Alliance conference Nov. 10 in Spokane. Some of the top items they consider are access to water, housing availability/proximity, soil, cropping history and market access. “Find out what your non-negotiables are first,” said Amy Moreno-Sills, Puyallup, Wash., farmer and PCC Farmland Trust farm to farmer coordinator. She needed water rights and a Pierce County location. Moreno-Sills is in the process of improving soil fertility on the leased ground. Moreno-Sills uses a custom-blend organic fertilizer, which she calls “vegetable crack,” because it’s the only thing that lets her crops grow, she said. Things are slowly improving after two to three years, Moreno-Sills said. She expects at least seven years before the land is recovered to the point the custom fertilizer isn’t necessary. Briggs works on leased ground. His leases are up every two years. “I have been a farmer seeking land, and I still am a farmer seeking land to own,” he said. Briggs said he keeps his equipment as mobile as possible, the better to move on to a new location. Jim Baird of Ephrata, Wash., renews a three-year lease each year. If the landowner or farmer decides to end the lease, they still have two more years before the agreement ends, he said. Good communication between landowner and farmer is critical, the panelists say. They recommend determining early which payments, improvements or repairs belong to the landowner and to the farmer. “You’ve got to move into the uncomfortable now, so it’s not way more uncomfortable later,” Briggs said. Kintzi recommends a formal agreement for both the farmers and landowner’s protection. Kintzi is also the coordinator for FarmLink, which is in the process of launching an improved, simplified website in the next month to connect farmers seeking land with landowners. Kintzi estimates the search ratio is eight farmers for one piece of land.